Short-back-and-sides haircuts can be seen in this 1950 photograph. The man to the left has the standard version, in which the hair is slightly longer on top while shorter at the back and sides. Other older men visible have the same style. 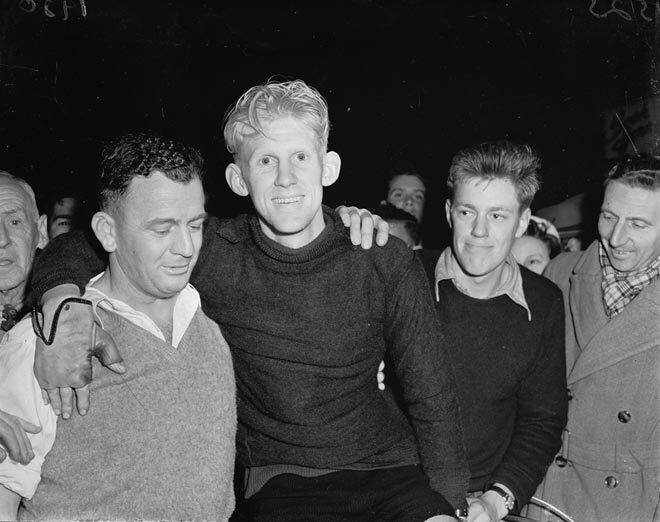 Snow Mitchell (centre) has a quiff (the longer, higher top and front of the hair) along with short sides (and possibly back). The ‘jug’ effect any version of the short back and sides had on men with prominent ears can be seen. The other young man in the photograph is also wearing a quiff style, with slightly longer sides, and he may have had a 'duck tail' at the back. The shiny, regulated wave in the hair of those men with standard short back and sides, like the defined curl in Mitchell’s quiff, suggest the use of Brylcream, a men’s hair-styling aid. A crew cut, in which the hair was the same length – generally about a centimetre – all over, was the third style worn by New Zealand men and boys at this time.